As Green parties rise in the polls, the former Green Party leader argues it's time electoral reform gave the Greens a change in Britain as well. The Council of the European Greens, the party’s supreme decision-making body, conducted its meeting in Berlin last weekend with high optimism and energy. Coming into it, great election results in Germany, Belgium and Luxembourg were being described as a “Green Wave”. And the day we started, with more than 550 participants, the biggest ever, a poll came out in Berlin showing the Greens as the most popular party in the German capital. Then on Saturday came the results from the Belgian city of Groningen, reflecting that trend, with the Greens doubling their seats with 21% of the vote. Meanwhile a poll for the Green-EFA group in the European parliament saw a record high across the EU of 8%. It’s clear why the Greens are doing so well in many European countries. As Ska Keller, selected with Bas Eickhout for joint candidates to be European Commission President (Spikzenkandidat), told the Council meeting: “We are the change-makers”. As an alternative to the destructive, dangerous populism of the far right, Greens offer positive, inclusive change. And as Amelia Womack, deputy leader of the England and Wales party, told the Council, Greens look beyond the next election to the impact of policies decades in the future. Her phrase “we are the grownups in the room” is one being echoed increasingly by independent commentators. Yesterday, the Observer was reporting on the impact of the Swede Isabella Lovin, first in the European Parliament in fishery policy, then in the Swedish government on world-leading policies to tackle climate change. It was telling, looking around Europe from the perspective of Berlin, however, how different the mood was in two countries, the UK and France. In both, masses of people were out on the streets, proclaiming their lack of trust in their governments and the mechanisms that have failed to deliver for them and their concerns. In France, it is the gilet jaunes, an organically developing protest against fuel taxes that grew into a much larger cry against the political class. Green Nicholas Hulot left the government over the failure to match the tax with social measures to reduce the impact on those who can ill-afford to pay it. It is clear that the continuing neoliberal policies of Emmanuel Macron, covered by the shiny, Blairite-style personality politics of his election campaign, are wildly unpopular. In the UK, it is Extinction Rebellion – protesters in London, Manchester and elsewhere – desperate about the state of our land and planet. From the failure to adopt policies of the scale and kind needed for preventing catastrophic climate change, to the continuing destruction of industrial agriculture on our desperately nature-depleted land. 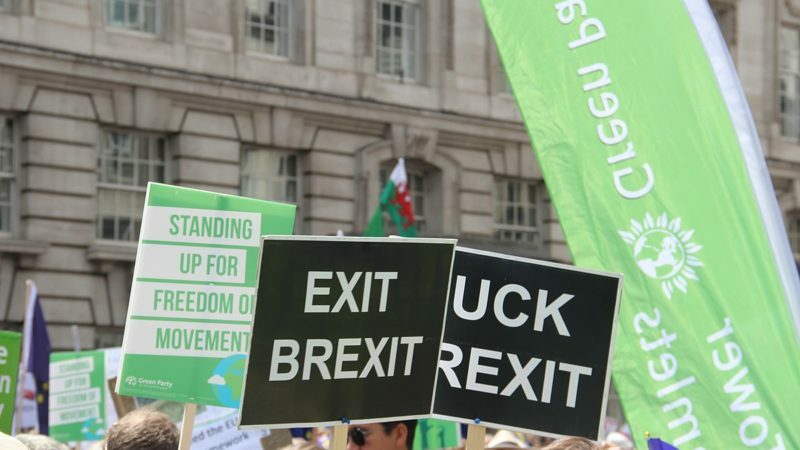 These protests follow the 700,000-strong “People’s Vote” march in London last month, where people gathered from all around the country in numbers unprecedented for over a decade, to demand they have a final say on Brexit. In Parliament that is not something supported by either the government or official opposition. And from Lancashire to Lincolnshire, protestors are today at the gates of fracking sites, in places where local governments have said no to fracking and been over-ruled by far-away Westminster. Today in Tinkers Lane, activists are enduring what as I write is a 74-hour lock-on, aiming to protect the Earth and the local environment there. But what unites France and the United Kingdom, beyond the protests on the streets? It’s their undemocratic political systems. France has a presidential system, putting large amounts of power in the hands of one person for five years, with a parliamentary two-stage election process that ends up with an unrepresentative parliament heavily biased towards the largest parties. In the UK, of course, as the Electoral Reform Society famously calculated, in the last election 68% of votes did not count. In 2015 the Tories won 100% of the power with the backing of 24% of eligible voters. The result in the 2016 Brexit Referendum was a clear cry to #TakeBackControl – people who felt, rightly, that they hadn’t been listened to for decades, saw a case where their vote would count and used it to express their hunger for change. Radical transformational change is clearly essential in our societies. Societies with failed economic, social and environmental approaches that can be summed up as neoliberalism, that greed is good, inequality doesn’t matter and we can keep trashing the planet. Continental models demonstrate that this can be achieved with democracy. That what the UK (and France) need. That demands a fair (proportional) voting system, where the views of the people are represented in parliament. And it also demands genuine local political power. That city and regional elections in Germany and Belgium produced such excitement is a product of the fact that local government has real power (and resources) there – while in the UK, and particularly England, councils have been reduced to little more than arms of the central government, delivering statutory responsibilities. The energy and excitement of the Green Council is inspiring not just in party terms. It is also inspiring in demonstrating what impact democracy can have on societies. It’s time we tried it in Britain.